Back when we had a Honda Gold Wing in the long term test garage, I tried riding the “886 pound touring beast” like a sportbike. 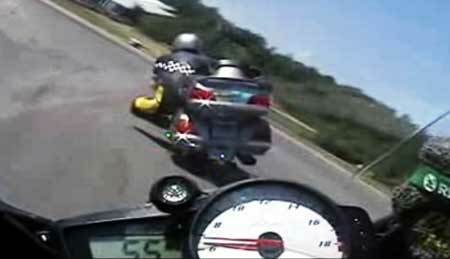 Apparently, I wasn’t the only one with that idea: as a way to promote totalcontroltraining.net and tonystrackdays.com, a knee-dragging, track video of a Honda Gold Wing was posted on bikerpunks.com. The vid is amusing enough, at least for the first few turns… but once the novelty fades, it does beg the question: what if you unleashed Andrea Dovizioso or Dani Pedrosa on a ‘Wing and a track? Dunno about you, but I’d pay to watch MotoGP-level skills applied to the plus-sized ‘Wing. This entry was posted in General Postings and tagged gold wing, goldwing, Honda. Bookmark the permalink.